Please find attached SSH key screenshop from google cloud. this file LF258.pem though I created the keys as directed in video but i didnt assign such name. IP is external IP of one of my VM Instances. Thanks. That section is when attending in-person instructor-led classes, for students to login to pre-built VMs. 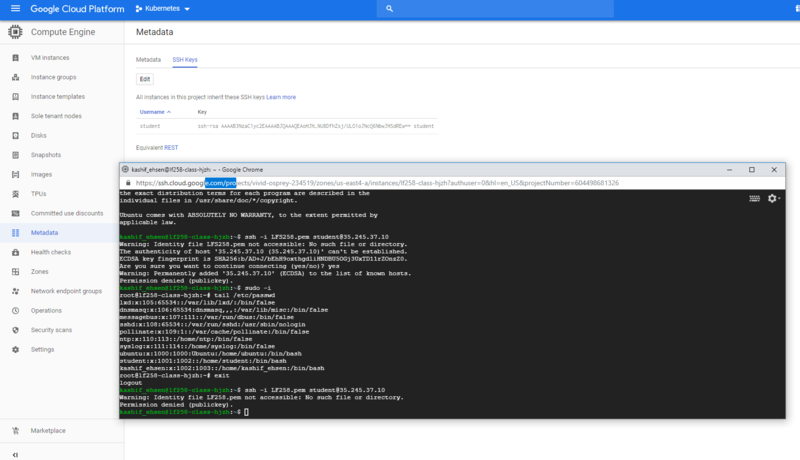 Since you are creating your own VMs and using the console from Google Cloud, you do not need the pem key files. Also, if you SSH into the VMs with the Connection SSH button from the VM Instances page, you won't need the pem key files. However, if you are planning to use a terminal from your local workstation, then you'd need to create the keys, have the public key on the VM, private key on local workstation, and ssh from local terminal using the key.